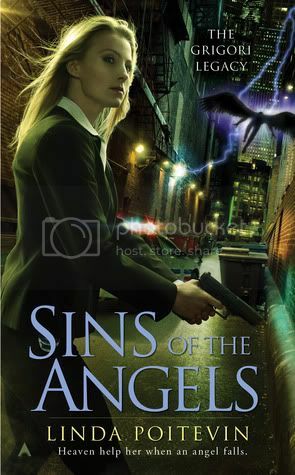 Linda Poitevin is on my blog today with a guest blog and there is also a chance to win her new book Sins of the Angels. 2. I can’t see the piles of laundry, crumbs on the counter, dust-puppies running across the floor, overgrown garden, stack of bills to be paid, or any of the many, many other excuses for avoiding work (and trust me, when I hit a snag in writing, just about any excuse to wander away from my computer will do!). 4. There are no cats trying to climb onto my shoulder, sit on my keyboard, nuzzle my chin, or chew on the pencil with which I’m writing. Nor am I left dusting off my lap, computer, and desk after such a visit. 5. There are no dogs pacing the floor with squeaky toys (ee-eee, ee-eee, ee-eee), trying to talk me into a walk, chasing the above-mentioned cats, or hopefully dropping balls onto my desk (he’s a very tall dog). 6. I’m less inclined to snack. At the coffee shop, I can’t just wander over to the fridge or cupboard whenever I like, and having to pay for every bite makes me a lot more discerning about how many bites I really need. Plus, fewer trips away from the computer makes for more words on the computer. How about you? Are you able to work from home on whatever it is you do, or are you as easily distractible as I am? Any secrets you can share to lessen those distractions? If you are located in the US or Canada you can choose between a print or a e-copy. If you are International then you can either win a e-copy from netgalley, or tell me if you want to put your name down for a print copy. 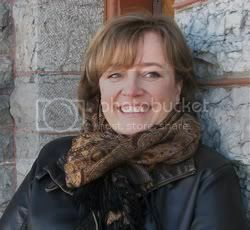 Linda will be picking 3 international winners to win print copies at the end of her blog tour. What a fabulous post. I really do need to get out of the house as all those things distract me! Thank you, Vivienne, and I highly recommend my method...there's certainly something to be said about the anonymity of "anywhere but home", lol! Great post, and your book sure sounds great, I have read some reviews already. I have to go to the office to work, can't do that at home. But when reading at home, I often get sidetracked by reading email, reading blogs, twitter etc. Especially when the book is not as good as I hope it is. Solution? Turn the pc off and sit on the sofa with the book. It was years after I had my first home-based business (proofreading, copy editing and writing) that someone said something to me that made SOOOO much sense, which is that when you work at home, you actually end up HAVING to do more housework, because you're there for most of your meals and almost all of your coffee consumption. D'oh! Now that I'm doing it again and finally have a dedicated room I use as a home office, it's made a world of difference. I can ignore the mess elsewhere as long as my office is workable. Glances around. Focuses on the computer screen. Ahem. :) But I totally understand your reasons for writing in a coffee shop. One other woman I know who worked from home off and for many years had a full-time (although not live-in) nanny and two highly disciplined and considerate daughters, who knew better than to interrupt their mother when she was on a conference call or in her office unless it was an actual emergency. Whether it's cats, kids, or dust bunnies, working at home requires every bit as much discipline if not more than working outside the home does, although oddly I find the discipline required relates more to taking breaks and ingesting food. I have the 'glued to my computer and chair from 9 to 5' pretty much down. Now to work on the work/life/human balance part of the equation. A great post and a nice tip but...there are no coffee shops near me. So I work at home. Yes, I tend to snarl at my dog if it is too persistent for my liking (fortunately he hates those noisy squeaking toys) but overall I manage. When I work I don't drink and don't eat. I do tend to be distracted by Internet shops though ;). I am very easily distracted when working at home because of the more familiar and relaxed environment. The only thing I can do to help make myself concentrate more is to turn off all additional sources of noise. I loved and totally understood all of her reasons! As I was reading it I realized how distracted I get when I'm trying to "work"! @Mel: the entire staff already knows me by name...I think that means I pretty much DO live there, lol. Hence the earbuds, Stephanie...without them, I'd be listening to every conversation in the place! I hear you about not getting interupted though. With a kid of 12 and 2 1yr old German Shephards well there is no peace here. ;D As seen in my very first Vlog today... squecky toy attack! lol! Hm... hints... I'd say a good case of the grouchies. No one will want to bother you then. LOL Na, honestly I have no idea. I guess just letting everyone know you need time and then enforce it. It's so hard! Great post! Distractions abound in my house - I even get distracted from doing housework. No where to go to fix that. I'm definitely in for the giveaway! Great post.I don't have as many distractions at home as she does. I'd be the opposite while at the coffee shop I'd be distracted by the food and coffee and the people around me. I can't really do my job from home, but if I could, I don't think I'd want to. I can really get into work and block out distractions, but I have a tendency to do that anyway and I need some human contact, so being at work is much better for me. I'm not easily distracted, but I can't work from home anyway. I am an old-fashioned paper-girl though, so I would really prefer a REAL book instead of an e-book :) I live in Holland. Terrific guest post, Linda!! I used to have my own medical transcription business and I worked from home for 16 years. I loved it! It was hard sometimes with 4 kids roaming around, but it was worth it to be home when they left for school and when they came home! yup, those are very good reasons to go to a coffeeshop to write. Whenever I have writers block it helps to get out of the house and write somewhere fresh. Unfortuantely I go to Panera Bread where there are good things to eat . I have a big problem with getting sucked into FB and my mailbox! Very funny post! I work in an office but yours sounds much better :-) Thanks for the giveaway! I love how you take yourself away from all diatractions to write. I often need to do the same thing even with day to day things!